Is Steel or Polycarb Roofing Better? Choosing a roofing material is an important task when building a home or another type of building. Two possible choices for roofing material include steel or polycarbonate, a manufactured plastic material. Each type of material has its own benefits and disadvantages. When trying to decide between the two, weigh the pros and cons for your particular building project. Metal roofing provides one option for a durable roofing material. When trying to decide between polycarbonate roofing and metal roofing, both could be seen as being particularly advantageous because of the durability they provide. Both steel and polycarbonate roofing can withstand the elements and tend to outlast more traditional roofing materials, such as asphalt shingles. 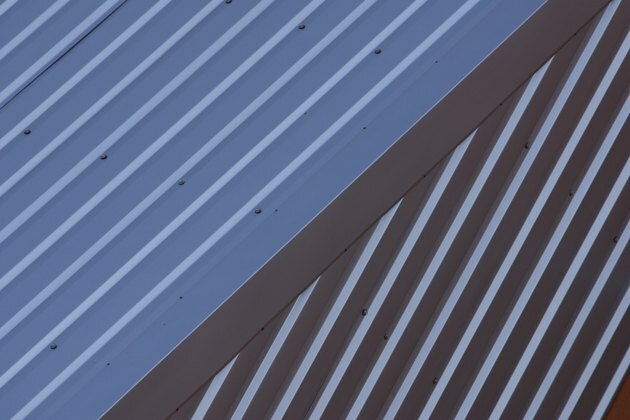 Steel roofing can, however, be susceptible to the constant expansion and contraction brought on by being exposed to extreme hot and cold temperatures. Over the course of time, steel roofing can rust if not properly maintained. Polycarbonate roofing tends to require less maintenance. Both metal roofing and polycarbonate roofing are easy to install. Neither one offers a major advantage over the other when it comes to how you install them. Both are extremely lightweight and can even be installed over an existing roof, making it unnecessary to rip off the old roof before installing. Both are simple to clean and both are fairly easy to maintain over the course of time. Steel and polycarbonate roofs differ from one another in terms of cost. Polycarbonate roofing provides a low cost alternative to more traditional roofing materials such as asphalt shingles. Steel roofing, on the other hand, tends to require a higher initial investment than these materials. This is the one true disadvantage that sets polycarbonate roofing apart from steel roofing. In the long run both provide an economical alternative because of the lack of maintenance or replacement, but you have to be willing to pony up some additional cash for a steel roof from the outset. The other consideration you need to make when determining whether to use steel or polycarbonate roofing material is the purpose for which you intend to use it in the first place. In other words, the type of building structure you're putting together should determine your choice. Polycarbonate roofing works better for greenhouses and conservatories because it can be made into a translucent material. Determine which type of material best suits your needs and make your decision based on your available budget. How Far Apart Do I Set Rafters for a Tin Roof?